Hi folks, here we are again giving you important and must be known car advisory tips that’ll make you the perfect car owner. Today, we’ll be discussing the correct way of washing a car and will also inform you about some commonly committed cleaning mistakes that will ask for your sweat and will do no good to your car. Now, after buying a car there are some rituals that we faithfully follow for few months or say for a year, without a miss. Like for example, routine service and maintenance work, careful driving to avoid potential scratches, and lastly try to keep the car as clean as possible (it suddenly becomes an early morning thing). Your true love for your car becomes more visible when you stop trusting your driver or even the car washing checkpoints with car cleaning, and decide to take the things in your hands. 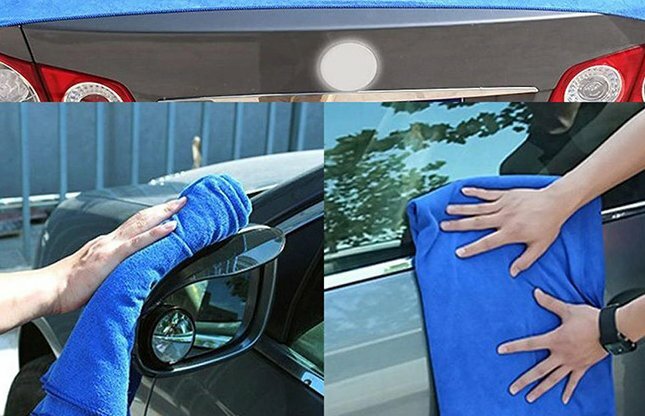 If you are the one falling in the same lot then this article is all that you need (obviously along with the right gadgets) to pamper your car to the best. 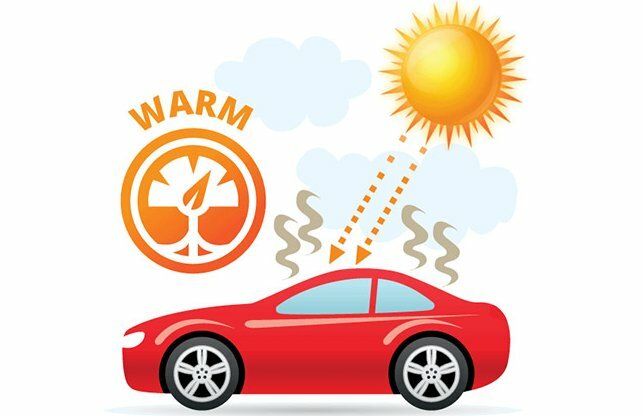 When the sun is shining bright and high in the sky, remember it’s the worst time to wash your car. Why? Well, it’s because during this time of day your car’s body is steamy hot and it will cause the water droplets to evaporate rather quickly than you wish, creating an ugly site of dried water droplets all over. Another, reason, why it’s not advisable to clean your car during high temperatures, is that chemicals present in sprays and car wax are not meant to applied on hot surfaces. 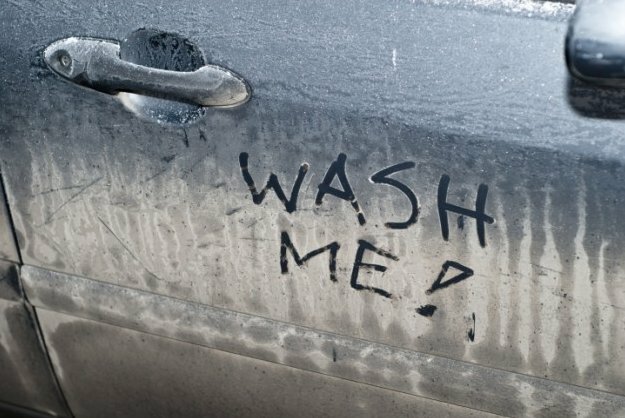 What you should do instead, is either clean your car in the morning or after sunset. But if you still wish to clean when the sun is high, do remember to park in the shed. Your father’s old t-shirt, toned down hand towels or any other aged useless cloth for that matter is not the right tool to clean your car. Why? Now that’s because even these old super soft looking and harmless pieces of cloth are not good water absorbers and constant dragging of the cloth may lead to scratches. 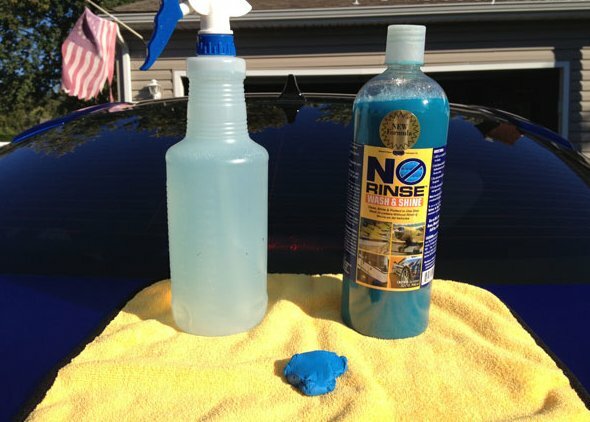 What you should use instead is a microfiber cloth that is gentle on your car’s body and also is a quick water soaker. Lubrication is must for your car’s proper cleaning and don’t you dare think that it’s another expensive useless product that your car is fine without. Why? Well, a good lubrication will not only protect it from scratches but will also leave it looking all smooth and shiny. Also, some people suggest that water alone is enough to solve the lubrication purpose, but that’s not true. What you should do instead is go to the nearest auto aftermarket shop and buy a lubricant best suiting your car (you can always ask the salesperson for suggestions). 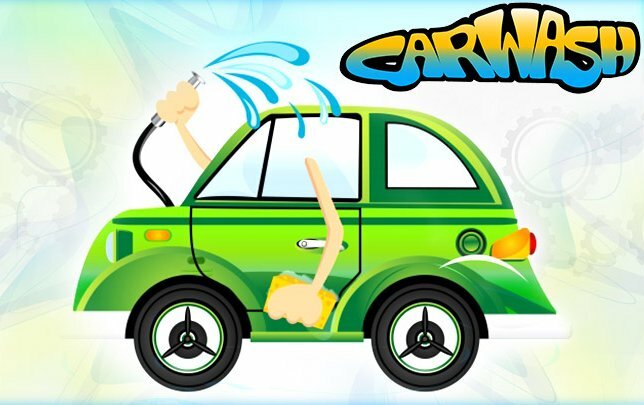 We suggest liquid car wax spray in the midst of washing process, for a smooth and properly clean surface. Using a single bucket of water while car washing is no less than a crime. Why? A single bucket of water indicates towards a fact that you are using the same bucket to fill in both the detergent water and fresh water (that you’ll use to rinse your car). 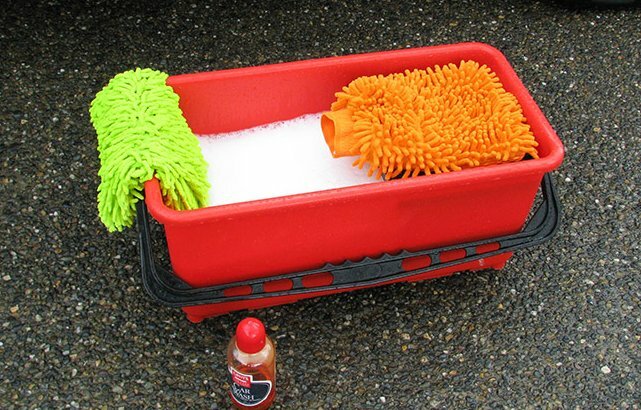 Now, after you are done applying soap on your car, and are now ready to wash it off, there are chances of some detergent chunks are still resting in the bucket (even after thoroughly washing the bucket). When you wash your car with this less soapy water, chances are that the detergent present in the water stays back on your car body and harm the paint. What you should do instead is use two separate buckets, one for storing fresh water and other for soapy water. You should avoid using products on your car that on first hand was manufactured for your kitchen dishes or for your hair. Why? Well, there is a simple explanation for the above-mentioned advice and that’s inconsistent Ph level of a kitchen soap and shampoo. Rater than doing good, these products can do harm to your car’s polish and wax. What we suggest instead is the use of car washes and shampoos, these products are not only gentle on your car but also serve the purpose just right. Why? Well, that’s because the top area of the car is one of the cleanest area and unlike it the bottom part attracts most dirt. Thus, requiring both areas to use different cleaning tools and cleaning pressure. What we suggest is to go for the top section first and in the last go for the bottom. 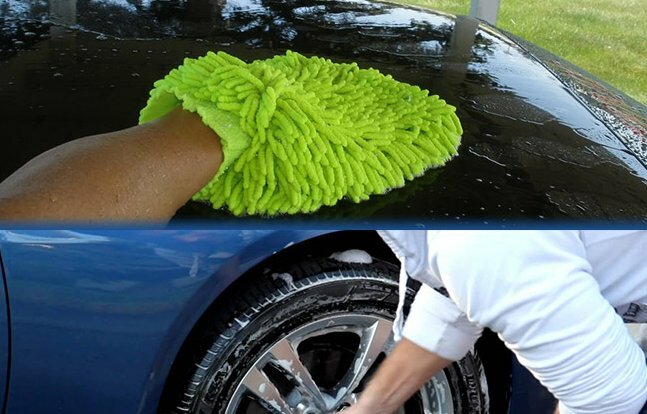 As for the cleaning tools, you can use a microfiber cloth for the top, wash mitt for scrubbing the bottom, wheel brush and plastic brush for wheels and tire respectively. Why? Now, we know that everyone likes his/her car all shiny both from inside and out, but that doesn’t mean that we’ll be using car wax on each and every part. Especially on steering wheel and gear lever as these parts require maximum hold and applying wax on them will loosen driver’s grip. What we suggest instead is clean these parts with soap water and apply mild lubricant after rinse. Lastly, don’t wait for your car to get dirty, very dirty before you plan to perform the cleaning ritual. Why? That’s because bird poops, dead buds and other chemicals can harm your car paint and wax by manifold. If they are left unchecked for long, your car may ever require a repaint job. What we suggest is wash off any dirt and debris the minute you notice them resting on your car. Happy Car Washing Guys, Do it right for the best shine!